Hello loyal listeners of The Nosh Show! Episode 83 is live and ready for your drive home, your workout, your run, your workday entertainment, your beach soundtrack, whatever works for you, we are here to amuse. And speaking of that, the Nosh Show is going weekly! (but maybe not as expected). 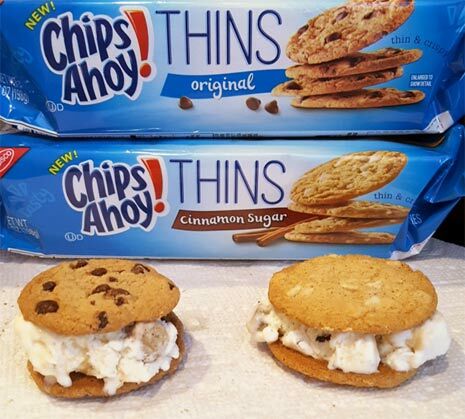 First up though, Chips Ahoy THINS! Stock up on the original before I eat them all! I really need to lay off of the exclamation points, but these new cookies are very enjoyable. The cinnamon sugar version is fine if a bit unremarkable. The original version though is quite easy to munch away (we ate a bunch that had been gently warmed by the summer day yesterday). They don't taste a ton like regular chips ahoy (which is a plus in my book), but they're crispy, crunchy, and I can shove a whole lot of them in my face without feeling guilty (four cookies per 150 calorie servings). Ok, that probably sounds cheezy, but if I eat regular crunchy chocolate chip cookies, I'm tempted to have 5 or 6 which is three servings. There is no way I'm eating twelve of these at a time. I derive plenty of pleasure from half that and then I'm still being good with the calorie count. Make sense? Hope so. We had a very busy weekend and my brain isn't spinning at full capacity right now. As far as the Nosh Show goes, yes, we are going weekly under the plan set forth by our wise leader Marvo. Basically you will still get your typical show every other week like you always have, but there will be an atypical show between those shows covering certain topics and not necessarily nosh or not. Candyology and What's Good at Trader Joe's will be folded in to this new line up as well. Marvo, Eric, Ryan and I will all pop up from time to time on this alternate week show as well as some new voices hopefully. Don't worry, Marvo explains this better during the show. 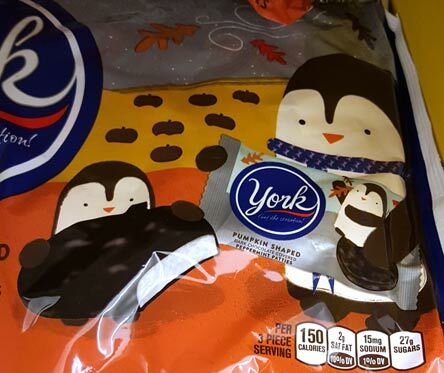 Nothing says Halloween like penguins holding pumpkin shaped candy! Alright have a good week everyone. As our show title suggests, Halloween candy is indeed hitting shelves as we speak. I gave in and picked up a fresh bag of candy corn like I always do. I pretty much only get one bag a year and I do it earlier because it'll taste better now than when it's half off in three months. What do you think you'll pick up first?